Measures the level by moving a measuring plumb bob up and down. No need for adjustment as the integrated computer automatically controls any offset. The meter lowers the measurement plumb bob hanged by a wire rope from the meter. 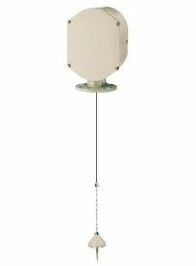 It senses change of wire tension when the plumb bob touches the powder level, and measures the distance from the sensor to the powder level. No need for adjustment as the integrated computer controls automatically. Automatic measurement is also possible (a timer allows you to set intervals in 8 steps from 1 to 60 minutes). Can measure 1 to 20 m.
The casing and major components are molded from FRP resin.